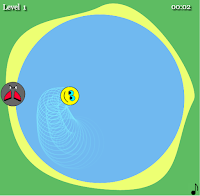 My first web game is based on a hard math problem from "How Would You Move Mount Fuji?" You are in a boat in the exact centre of a perfectly circular lake. There is a goblin on the shore of the lake. The goblin wants to do bad things to you. The goblin can't swim and doesn't have a boat. Provided you can make it to the shore — and the goblin isn't there, waiting to grab you — you can always outrun him on land and get away. The problem is this: The goblin can run four times as fast as the maximum speed of your boat. He has perfect eyesight, never sleeps, and is extremely logical. He will do everything in his power to catch you. How would you escape the goblin? So, your task here is to solve this problem (authored by Martin Gardner, by the way!) Your character follows your mouse. Get to the the lakeshore as fast as possible. Avoid being caught. great idea, awesome concept but there's a whole lot more to work on. Nice idea, i liked! Its hard by the way hahah!